Brazil: new Fiat models to wait for the new plant? This is how Pernambuco new plant will look bu early 2015. It is located in Goaina, PE, in North-East part of Brazil. 7 thousand people are working now in this new complex, that will host 4 thousand direct employes. Fiat 500 SUV rendering made by Car and Driver. While Fiat Europe tries to resist one of European worst car industry crisis, the situation in Brazil is quite the opposite. The brand keeps leading the market, it has a big range of products, and the awareness and good image among Brazilians is absolutely good. Of course, things are not as easy as before, as the Brazilian car market is becoming saturated with the arrival of new important players such as Hyundai, and the coming Chinese brands. 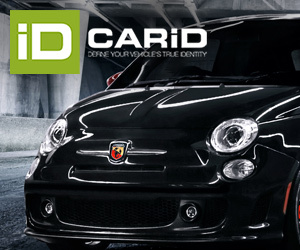 Fiat is very strong in B2B market, and this allows it to rank first in monthly car sales. The market grows fast and its potential is still high. The brand wants to be part of this continuous boom, and that’s why it is building its second plant. Pernambuco factory was scheduled to start operations by the end of 2014 with annual output of 200.000-250.000 units/year. Fiat invested more than 4 billion reais (1,3 billion euros) in this new plant, which covers an area of approximately 12 million square meters (in the first half of this year, Fiat earned 351 million euros in Brazil). Excluding Chrysler’s take over, which is recently becoming a big problem, Pernambuco is perhaps Fiat’s most important project nowadays. 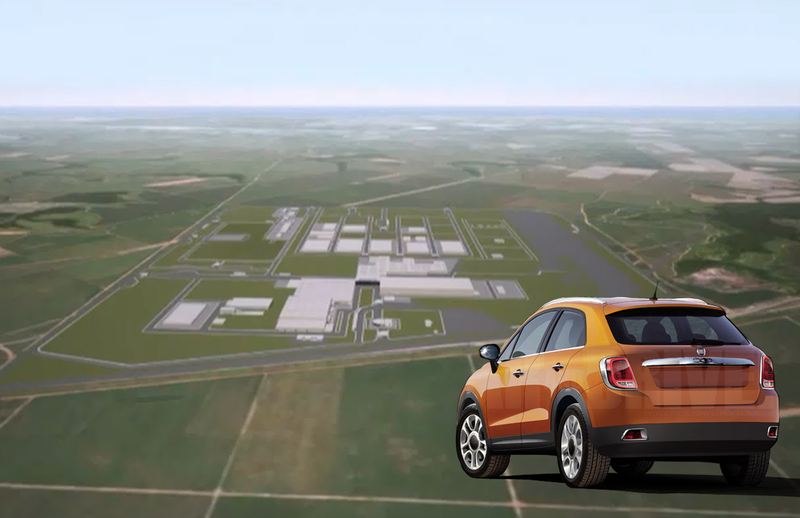 Click here to see Fiat’s Pernambuco plant construction plan. Fiat has a wide range of products in Brazil. 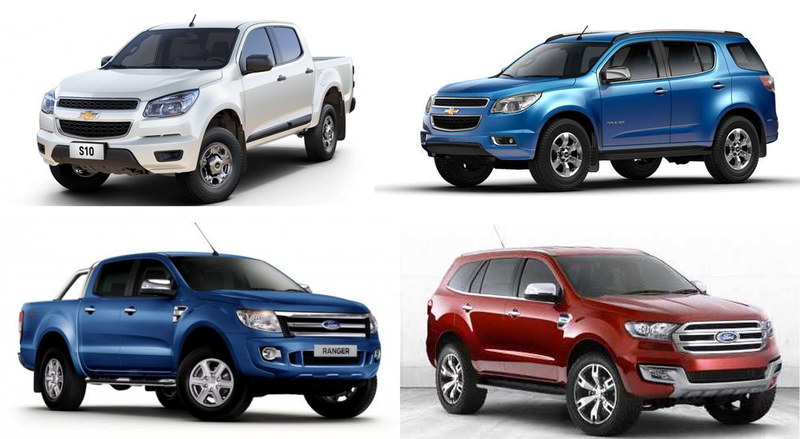 However it is not present in SUV and mid size MPV and pickups. 2012 share numbers. The question regarding the new plant is new cars and their launch dates. The Palio/Siena were the last major launches of the brand in Brazil. It happened in late 2011 (Palio) and in 2012-Q1 (Siena), and since then Fiat has maintained its current range updating it with special editions or tiny facelifts. It was very evident during 2012 Sao Paulo motor show, when the Italian brand lacked of real new products, while VW presented the Taigun concept, Chevrolet introduced the Onix, and Hyundai showed the HB20X. Fiat shouldn’t do that in a market that represents almost half of the brand’s global sales. Brazil deserves the largest range with fresh products, and should be the perfect scenario for the development of new cars for new segments. Certainly, Fiat is working on several products for the coming years, but the question is when they will be available in the market, and what’s the role of the new plant in the company’s future model launches calendar. These could be the current project Fiat Brazil is working on right now. More presence in SUV segment, a possible new Mille for next year and the Viaggio for 2016. No new MPVs? It makes no sense to start a new production line for an all-new car in an old factory, when a new one is expected to start operations in a bit more than 1 year. But this assumption means that no all-new Fiats would arrive into Brazilian dealerships before early 2015. Fiat would only update its current range during 2014 (an upgraded Uno is expected to hit the market in the next months), making it even more vulnerable to the fast-growing competitors. The 4 main products, Uno, Palio, Siena and Strada are somehow safe as they are very strong in B2B market. The Punto has its own place in ‘B-Plus’ segment, while the Idea loses market share, and the Palio Weekend leads in a very small segment. The Linea and Bravo reached their sales-peak already and they are quite far from the leaders in C-Segment. Fiat is about to introduce the new Fiorino to boost its LCV sales. But is it enough to wait another year for an all-new nameplate? the brand has reached its market share peak and it is not expected to increase it anymore. In the best case, it will be able to maintain it thanks to its strong position in the market. However, there is a high risk of staying behind in fast-growing segments where Fiat is still not present. Even if the Trailblazer (up right) and the Everest (bottom right) belong to D-SUV segment (they are quite big to be in C-SUV), they use the body architecture of mid-size pickups. Fiat could do something similar from a mid-size pickup developed along with Chrysler, and create a C-SUV. 6 new projects might have take place right now in Fiat Brazil. Even if it is unclear where these products will be produced, it is more logical to think that they will be part of the production lines of the new plant. According to Brazilian press, 5 of this 6 new cars correspond to SUV/Pickup segments, which would indicate that the new factory could be focused on the production of larger products. Fiat will bring several SUVs in the next 2-3 years. The first car to come on scene would be the B-SUV using Fiat logo and closely related to the Fiat 500X, but using different platform and components. Fiat knows it is out of a this important segment and it must bring its proposal as soon as possible. Unfortunately, based on the source, Brazilians would have to wait till January 2015 for it. By the same time, the brand would launch its very first mid-size Pickup, C-Pickup, to enlarge its offer in Pickup segment, and compete with the VW Amarok, Chevrolet S10, and Ford Ranger. Both projects would use the Fiat Viaggio/Dodge Dart architecture. By the end of 2015, it would be the time for Jeep: a B-SUV, again, related to the coming new Jeep B-SUV (possibly called Jeepster), and a larger SUV based on the mid-size pickup of Fiat (as Chevrolet did with the Trailblazer based on the S10, or what Ford will do with the Everest, based on the Ranger). This time, Fiat would offer the larger pickup, making use of its strong image in pickup segment, thanks to the Strada; and Jeep would offer the SUV version, making use of its positioning as SUV brand. 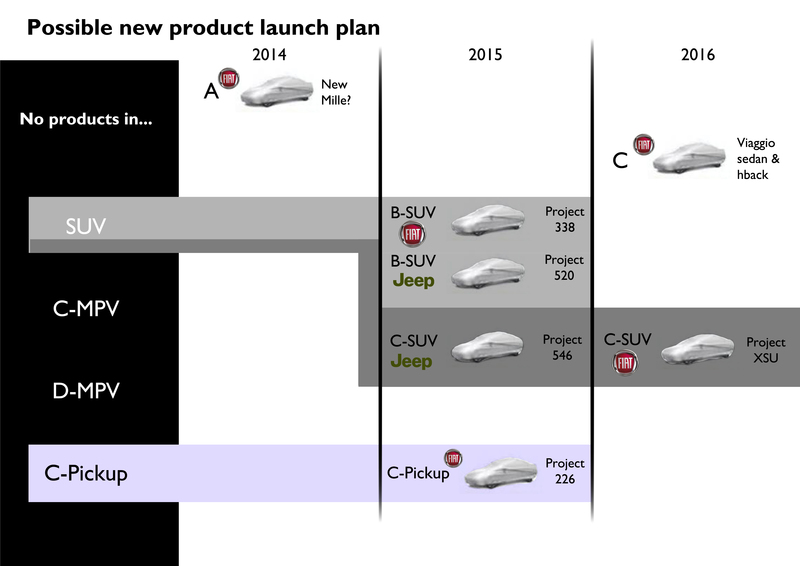 Months after Jeep’s launches, Fiat would bring its own mid-size SUV based on the Jeep (early 2016). Finally, in the first half of 2016, Fiat would launch the locally built Viaggio (hatchback and sedan) to replace both, the Bravo and Linea). Of course, these products aren’t confirmed by Fiat. If the plan is correct, I would say there is a correct shift in Fiat’s approach to the market. 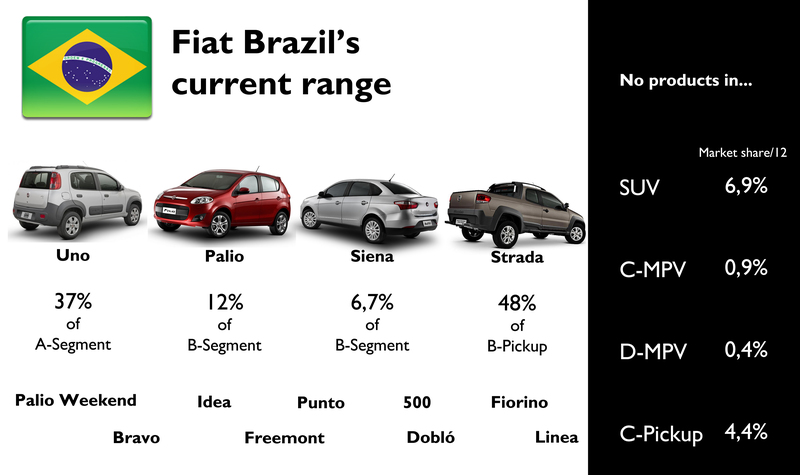 Brazilians will soon move into SUV segment (even if in 2012, it counted for only 7% of total market), and if Fiat wants to keep its leadership it must have not one but many SUVs in its range. It is even better if the offer is enriched with Jeep products. A larger Pickup is also an interesting step, as it makes use of Chrysler’s knowhow, and it could find a nice opportunity in other markets, such as Argentina (mid-size pickups counted for 79% of total pickup sales; all pickup segment counted for 10% of overall market), or South Africa. However, I think there are some problems. The Bravo and Linea can’t wait that long for a successor. It is an already-existing product that would only need some adaptations to fulfill Brazilians taste and regulations. Besides, there is no information about small segments. A low-cost entry city-car should be in Fiat plans, in order to keep its leadership in A-Segment (built-in Betim, it could be the surprise in 2014). The Uno is a good product but it has proved that without the old Mille, its sales aren’t that good. No MPVs? an adaptation of the 500L could work in Brazil. And what about premium segments? Audi has just announced it will produce the A3 sedan and Q3 in a new plant. Alfa Romeo will be introduced next year with the MiTo and Giulietta, but both imported from Italy. Fiat should think of including Brazil in Alfa’s future plans, even if Marchionne just said all future Alfas will be produced in Italy only. Thanks to my friend Leonardo Zanella for the information. Juan, I have to congratulate you about your blog/website. I love to read your posts, It’s easy to read and very helpful, with a lot of information. I’m glad to help you too! New small SUV based on 500x to replace Palio Weekend/Adventure. Viaggio replace Linea and Bravo (perhaps holding the name of both). Great information on FIAT’s Brazilian plans. I’m looking at the premium market exploding in Brazil, – BMW, Audi and MB already have big plans, FIAT should also be seriously taking one of it’s luxury brands there. If Alfa isn’t ready perhaps introducing and producing some Lancia models which might be well received by the Brazilian market. We all know Lancia needs to look at al serious growth markets, it’s just won’t survive as a one market brand. Unfortunately Lancia is dead. So better pushing Alfa Romeo, which needs new export markets to survive. Unfortunately you are probably right. Lancia needed to get back to it’s design and performance roots, not try to be a quasi-luxury brand with rebadged Chryslers. The only way to revive Lancia is what FIAT has talked about doing with Alfa. Team up with another automaker (like Mazda) to cut development costs and introduce more acceptable drivers car. Explain me why you think a Mazda 6 is more a true Lancia than a Chrysler 200. I also think that a Mazda 6 would be more Lancia than a Chrysler. It handles really well and perform as a sporty sedan but is confortable and elegant, so it is more Lancia than an american developed soft tuned. Lancia is not what it used to be. It couldn’t survive with only its fans base. It needs global products and that’s why Chrysler is so important. i read a descriptif article on wikipeidia about Cnh Industrial (Fiat Industrial) it says that Cnh Indistrual is Netherlands buses and trucks maker ???? is this true or just a mistake, because Fiat Ind its italian buys Cnh Global and merged with it and have their headquarters in netherlands ! For tax reasons CNH Industrial is incorporated in Netherlands as Fiat did in the past and probably Fiat Chrysler will do. And is quoted in Wall Street too. Milan is only a secondary market. Thanks for such a well-written write-up. Makes me want to crack running a blog once more. Any kind of information of how most effective to get started..